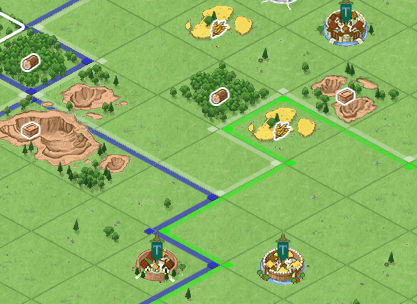 Besides bug-fixes, the latest update also saw the implementation of a new look and sound in the Closed Beta of Travian V.
The map now appears in rich green color, which makes the game appear more lively. Apart from this improvement, the borders around the areas of influence of kingdoms are now also displayed clearer than before. But that’s not all. There is another novelty – the sound that comes out of your speakers since the last update. Not only is there background music, but interactions with buildings and other game elements will also trigger different sounds. This makes the game experience more authentic. But why was sound introduced to the game anyway? Who’s the guy in charge of them? Where’s he from and with what intention in mind did he create the music and sounds? We will give you the answers to these questions in the coming weeks. But here’s one thing right away: The person who’s behind the sounds in Travian V is well-known and some of you will have already listened to one or more of his works. Look forward to our big interview!